What would a tablet have to do to be seriously considered as the best place for you to play games? Native Twitch streaming? Good-as-console versions of popular games? Play-from-your-couch capability? Nvidia's new gaming tablet can do all of that. And some extra stuff besides. You can use a controller with it, too. It's been about a year since Nvidia started selling the funky portable gaming hybrid they called The Shield. While the screen-and-gamepad handheld does a lot of things well, it's not necessarily something an average gamer needs in his or her everyday life. A tablet is, however. 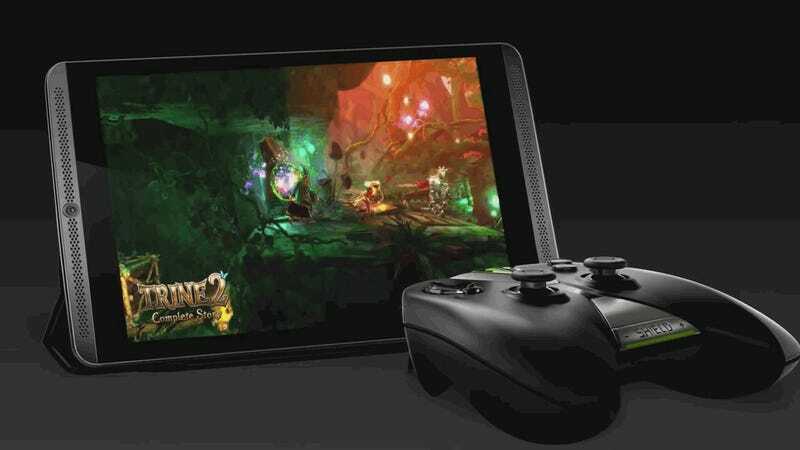 So, Nvidia's hoping that cramming Tegra K1 architecture and its GameStream technology into an 8-inch Android tablet will be enough to entice game lovers looking for a new touchscreen. It'll have a console-style pad controller that's sold separately, too, since Nvidia built up some know-how as far as making those over the last few months. Starting this week, the Shield product line will consist of three things: the already extant Shield Portable (the new name for the handheld released last year), the Shield Tablet and the Shield Controller. The tablet is the big deal here, obviously. It's got the same processing hardware as in some of Nvidia's burlier PC components, which lets it support the same API capabilities as a GeForce Titan card. Folks will also be able to add up to 128 GB of storage via a microSD slot. The Shield Tablet and Controller will be available on July 29 in the U.S and Canada at $299 for a 16GB wifi-only model. a 32 GB version with LTE is due in August for $399. The controller will go for $59.99 and a cover that converts to a stand will cost $39.99. I got to see and play the Shield Tablet during a meeting in New York City last week. It can essentially do all the streaming tricks that the Shield Portable is capable of. One demo had a rep playing action-platformer Trine 2—which comes pre-loaded for free on the tablet—locally off the tablet in 1080p on a big screen. I played Codemasters' racing title Grid 2 via Nvidia's Gamestream technology, which sent the game to the tablet over wifi from a local laptop. The Shield Controller connects via WiFi Plus, not Bluetooth, so as to minimize lag. I didn't notice the slightest bit of lag but, of course, these conditions were optimized to show off the tablet and services at their best. You'll also be able to connect the Shield Tablet to an Ethernet line with a converter to a host-capable micro-USB port. All of the titles on the company's Grid game-streaming service (still in beta) will be playable on the tablet, too. When it comes to Twitch integration, the tablet will also work with chat headsets and uses the front-facing camera to get your face in the stream. A brief demo showed a slight bit of delay but that's to be expected from a mobile device. Another demo featured the same shiny Unreal Engine 4 demo that was shown at Google's I/O conference recently with no compromises made for running on a tablet. As for productivity, it'll ship with a fancy stylus and have handwriting recognition for over 50 languages. You'll also be able to launch certain features like search and media playback via voice command, thanks to Google Voice API. The Shield Tablet bundles a lot of power behind its 8-inch screen. It's a top-class Android device with a slew of features that only it can pull off. We'll have more hands-on impressions with the all-in-one slab in the coming days.